Premier Copacabana Hotel은 코파카바나 해변에서 500m 떨어진 훌륭한 위치를 자랑하며 우아한 객실을 제공합니다. 탁 트인 옥상 수영장에서는 3km 거리에 있는 브라질 예수상의 전망을 감상하실 수 있습니다. Premier Copacabana Hotel의 객실은 가벼운 크림 색상과 초콜릿 브라운색의 가구로 꾸며져 있습니다. 모든 객실은 LCD 케이블 TV, 에어컨 및 무료 Wi-Fi를 갖추고 있습니다. 투숙하는 동안 바에서 맛있는 카이피리냐를 즐기거나, 부를리 마르스가 디자인한 겨울 정원에서 휴식을 취하시는 것도 좋습니다. 세계 각국의 요리를 선보이는 레스토랑에서는 매일 아침 크루아상과 계란으로 구성된 조식을 맛보실 수 있습니다. 시퀘이라 캄포스 지하철역은 호​​텔 앞에 있습니다. 코파카바나 포트는 프리미어 코파카바나에서 3.2 km거리에 있습니다. 산토스 두몽 공항은 숙소에서 9.7km, 갈레앙 국제공항은 숙소에서 23.2km 떨어져 있습니다. 신용카드로 결제/선결제 시, 도착 전 결제 승인 양식을 작성하셔야 합니다. 웹사이트에서 예약이 확인되는 즉시 이메일로 양식이 전송됩니다. 더블침대는 가능한 경우에 한해 제공됩니다. 더블침대 이용이 불가능한 경우, 붙여서 더블침대로 사용 가능한 싱글침대 2개가 마련된 객실을 배정해드립니다. 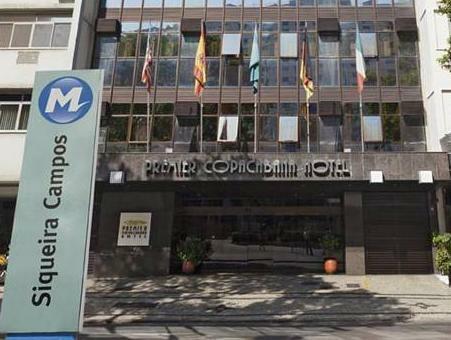 Premier Copacabana Hotel의 주차장은 일반 승용차만 수용 가능합니다. 주차장에는 트럭과 SUV는 주차가 불가능합니다. 또한, 주차 공간이 한정되어 있으므로 주차장은 가능한 경우에 한해 제공되오니 참고하시기 바랍니다. 예약 시 유아용 침대를 이용하실 수 있습니다. 코파카바나 비치에서 떨어져 있어서 불편했고, 전체적으로 시설이 노후 되어 있어서 가격대비는 별로 였습니다. 좋았던 점은 음식이 괜찮았습니다. 위치도 좀 불편하고, 방 위생상태도 별로 좋지 않고, 이상한 냄새가 나서 청결하지 못했습니다. 좋았던 점은 음식이 맛있었던 것입니다. Clean hotel in good location. Walking distance to beach. Will return. This hotel is not vary far away from the airport. It is vary close to the beach , you can enjoy the weekend around the beach. Lots of restaurants locates near the hotel. It is a good choice for you to stay in Rio De Janeiro. It was Carnaval period so all the hotels were very expensive. However, for the price paid, i certainly expected a decent level of cleaniness and service. Unfortunately, due to the high occupancy rate during that period, service was sloppy and cleaniness so-so. I could not believe how bad this place was. First of all, I went to my assigned room and found the door open, the room not cleaned and generally looking like a construction site. A trek back to the reception resulted in getting a different room (although without anything resembling an apology), but in the end the new room was only marginally better. In fact, it felt like a motel in a bad neighborhood (and in Brazil a motel is priced by the hour). Specifically, I could not count the number of stains on the carpet, resting my arm on the desk resulted in black smudges, and the bed cover smelled like pee. In short, it was disgusting. In addition, all amenities were extra. The internet that was supposed to be included in the price was so slow it was unusable. Paying an extra charge for high speed improved it a little, but the signal still kept dropping all the time. Also, I try to put my documents in a safe box in my room and after calling the reception I discovered that there was another charge for it daily. At least the breakfast was free, and while not fancy, I was surprised to find that it was edible. In conclusion, this place was dirty and tried to charge me for basic amenities that should be included. The price is not cheap. Not recommended. this hotel was in a good location, had a really nice breakfast and staff that were helpful and spoke english. the bar tender was also lovely and made awesome cocktails. however, the rooms are quite basic and do not match the nicely appointed reception area. i would have expected more from a "4 star" hotel. for the exhorbitant price we paid (granted it was new year) i definately had expected better rooms, however for normal (non nye non carnival) season this was fine. hotel has seen its best days. If you like old charm, then this would be your hotel, but the furniture, the bathroom (rusty bathtubs) and the beds were old and worn out. breakfast room was very busy and difficult to find a table. the best is the location: directly on the Avenida Atlântica with a view on the Copacabana if you are lucky enough to get a room with a sea view (only about 30% of the rooms). The locations was good and the service was OK, but not that friendly. Internet connection is slow , but can pay for faster. Breakfast is good, although they don't have a toaster! Rooftop pool is nice, but wi-fi doesn't work up there. Well placed hotel with good service. At first the rooms look a little rundown but the modernist 50's touch has a certain charm. Safe area and good connections to praia, bus and metro siquiero campos literally just around the corner. Rooms are OK, not too big, but also not too small. The hotel is correct, you´ll find the basic things you need. Location is good in Copacabana. Staff is not too nice and helpfull though. Good and clean hotel, the rooms are good sized and clean. internet connection is working without problems, and the staff is friendly. Clean, good service, nice rooms and not so small!! compared to other hotels in this area very good. Needs free internet, wider door to the bathroom. The hotel is across the street from the Siqueira Campos subway. Many sucos nearby for food and drinks. There's also a supermarket close to do shopping for snacks, water,etc. The standard room is small and the sheets and a little weird smell. There is "free" internet at a slow rate but you still have to pay for each day I connected. There are two rates for faster connection. The in-room safe is not free which is a negative. They ask you during check-in if you are going to use it. Seems like a rip-off. Great location but I'm sure there are better hotels for a better price. Front desk staff was very helpful in proving tourist information and reservations. Some reservations could only be paid for in cash, not with a credit card. New electronic key system is an improvement over the previous one that often provided frustrating attempts to enter rooms.